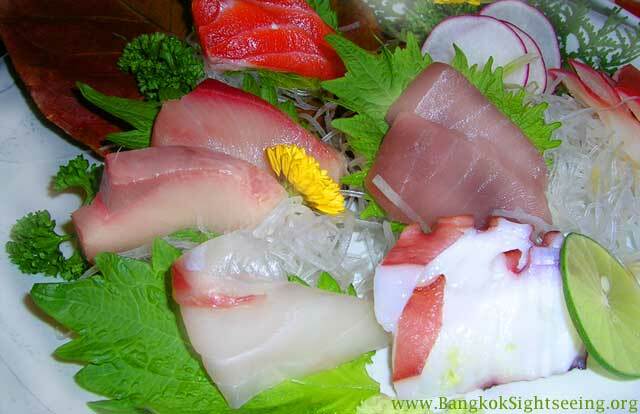 If you’re in the Silom area, Sushi Tsukiji is a nice place to stop by for Sashimi. It belongs to the Fuji brand, which is a Japanese chain store (or franchise? ), but this one is a more upscale version of it, with better ingredients. 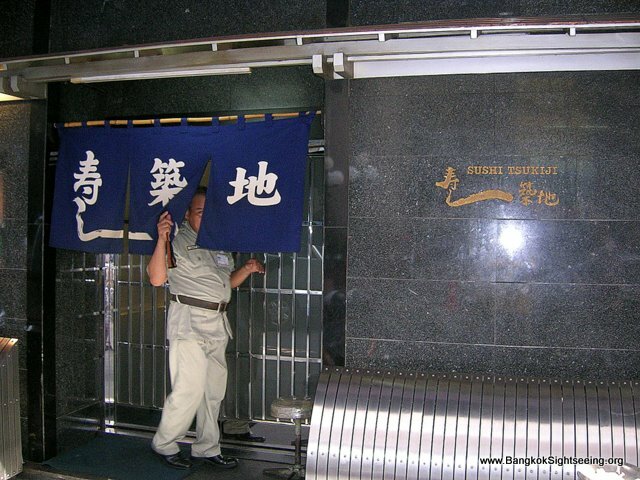 It’s named after the famous Tsukiji fishmarket in Tokyo. They have counter seating (where you sit in front of the kitchen counter and get to see how everything is prepared in front of your eyes, which I recommend) and private rooms upstairs. If you’re going for Japanese food in general, I’m not too fond of this place. Only if you want Sushi or Sashimi. The guests here are mainly Japanese, particularly Japanese businessmen who work in the area it seems. One piece of advice – when you go here, order the “Special Sushi Set” – it’s something that is not actually on the menu. It’s the sushi selection of the sushi chefs – and it’s probably the greatest value you can get for your money. Sometimes the waitress will pretend as if she doesn’t know what you’re talking about – just repeat (friendly) that you want the Special Sushi Set, and eventually she’ll give in and recognize what you’re talking about. The picture doesn’t look so yummy – which has more to do with my faulty photographer skills than the presentation of the food. If you see it with your own eyes, you’ll love it though. And this is what it looks like from the outside – quite easy to recognize. When you’re walking Soi Thaniya down from Silom road, it’s located on the right side.